Warm brulÃƒ©ed pears topped with creamy vanilla bean ice cream. The perfect way to end a special meal. Place pear halves cut side down on a baking sheet in an oven that has just been turned off. Leave for about 30 minutes or so (they should be warm and softened). 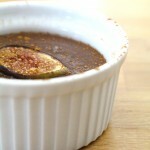 Sprinkle with sugar and torch (like you would a CrÃƒªme BrulÃƒ©e). If you had leftover pears (brulÃƒ©ed or not), you could eat them for breakfast topped with granola and yogurt!